This 270-square-foot master bathroom is lavish with a blend of marble coverings. As the bathroom is primarily covered in marble, coordinating each element was a challenge for designers at K-Build Design. It took approximately six months of searching suppliers and waiting for new marble lots to arrive and be approved to finalize all of the selections. But it was worth the wait! 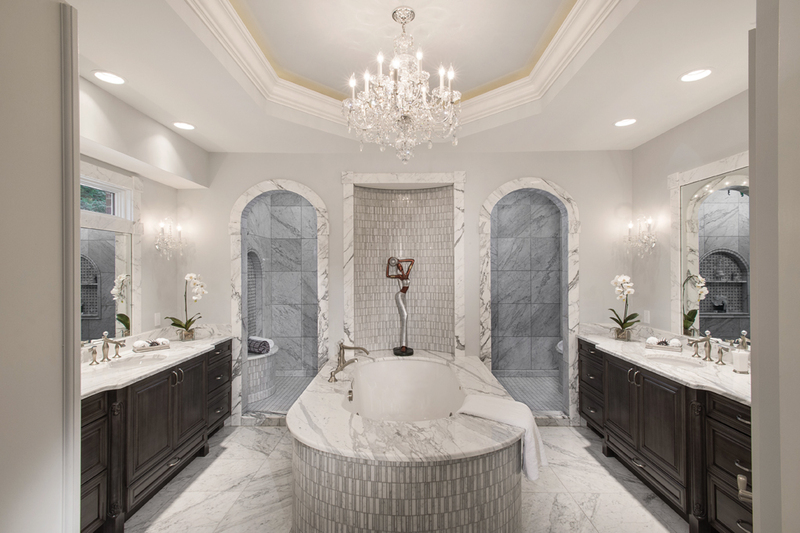 A total of 670 square feet of 18”x18” Venatino marble tiles and hundreds of AKDO Carerra marble trim pieces were used and hand-selected to achieve a flawless image of grace and function. Your eye is drawn to the arched door casings that are detailed with keystones as well as the window casings, vanity tops and tub deck. The three slabs of Calcutta Oro add movement and interest. The weathered slate stain on the vanities provides a beautiful contrasting element to the marble and evokes balance and harmony. 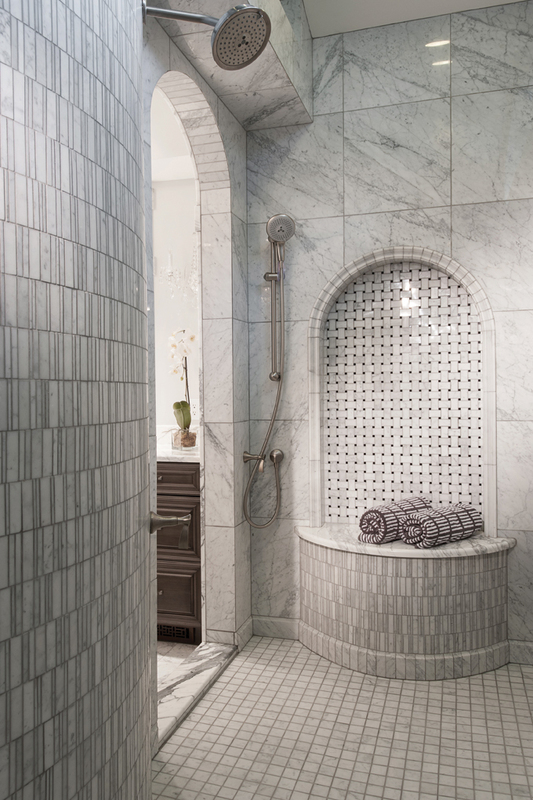 As you step into the double-entry shower, three insets draw your attention. Adorned with a mosaic overlay and a basket weave mosaic inside the inlays, the insets are the perfect place for storing shower essentials. To complete the elegant look, fine crystal detail on the plumbing and lighting fixtures create a beautiful illuminated radiance. The marble work in this bathroom is outstanding! The space is very symmetrical and balanced. The window in the shower provides needed natural light.